On Sunday we (the language course participants) went on a hike to Spiegelslust, a 19th-century watchtower. It’s also known by the name Kaiserwilhelmturm (Kaiser Wilhelm’s Tower) but Marburgers dislike this name, for reasons that aren’t entirely clear to me. I can see the arguments for both sides of the uterus-or-heart debate. The hike up wasn’t much of a hike at all; it really only took about 15 to 20 minutes. It was nice to spend some time in the woods though. It’d been a while since I had really been in nature. The area surrounding the tower provides some wonderful views of Marburg. I didn’t go up the tower itself (it cost a couple euros), but you really don’t need to if you just want to overlook Marburg. 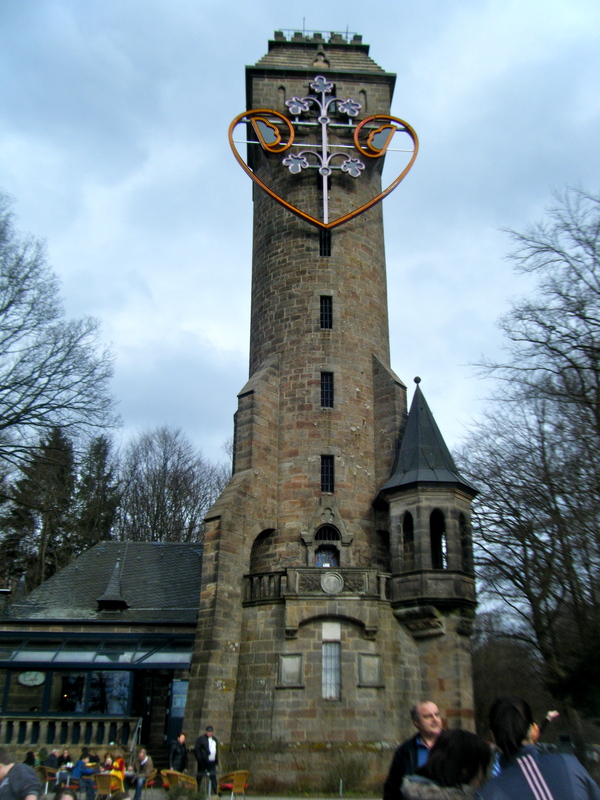 The front of the tower is adorned with either a heart or a uterus (depending who you ask – see the picture and decide for yourself) that lights up at night when you call some certain number. So whenever you’re walking around the city at night, if you look out into the hills you can usually see the tower brightly lit up. We sat down to enjoy the outdoors at one of the cafes near the tower. I opted to just have a hot chocolate – the food there was way too expensive, in my opinion. I try not to spend more than 5 euros a meal and am usually successful in this. The hike back down was somewhat more eventful. Those of us living in the dorms that were in the vicinity of the tower split off from the rest of the group, sent off with vague instructions of what the right direction was. As we began walking there were multiple forks in the path and we weren’t certain we were heading the right way at all, but eventually we came out on a familiar street and were able to figure out the way home. I’m certain there had to have been a better way than the one we chose, however. But I’d really like to go back to the tower sometime, especially on a sunny day, when I’m sure the view of the city below is much nicer. 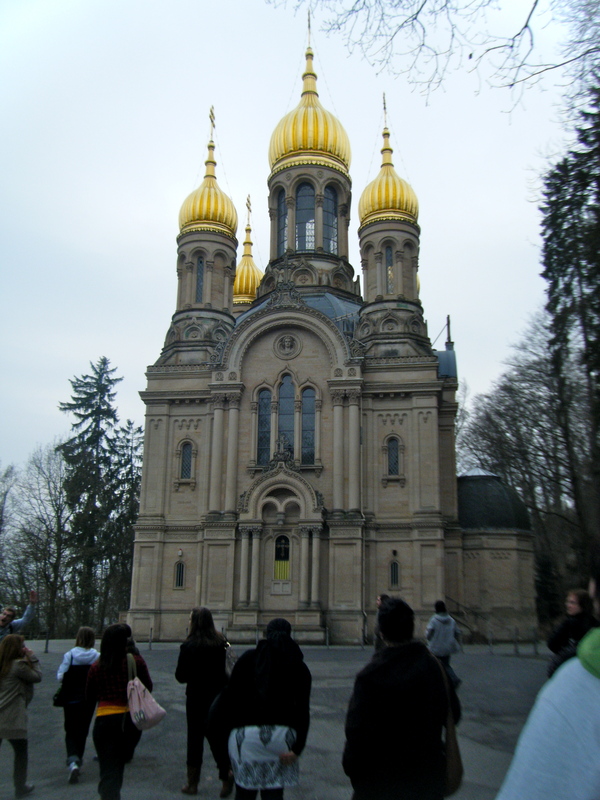 On Wednesday we went on a group excursion to Wiesbaden, which is the capital city of the state of Hessen. It was about an hour and a half bus ride, and we got into Wiesbaden around 10:30 a.m. We immediately went to the Landtag, the seat of Hessen’s state government, for a tour. I had the option to take an English tour, but I decided that I needed to start challenging myself more and so I went on the German tour instead. This was definitely a good choice – it wasn’t nearly as challenging as I had feared, and I would say I understood about 80 percent of what was said – not bad. Inside the old part of the Landtag. The tour itself was very interesting. 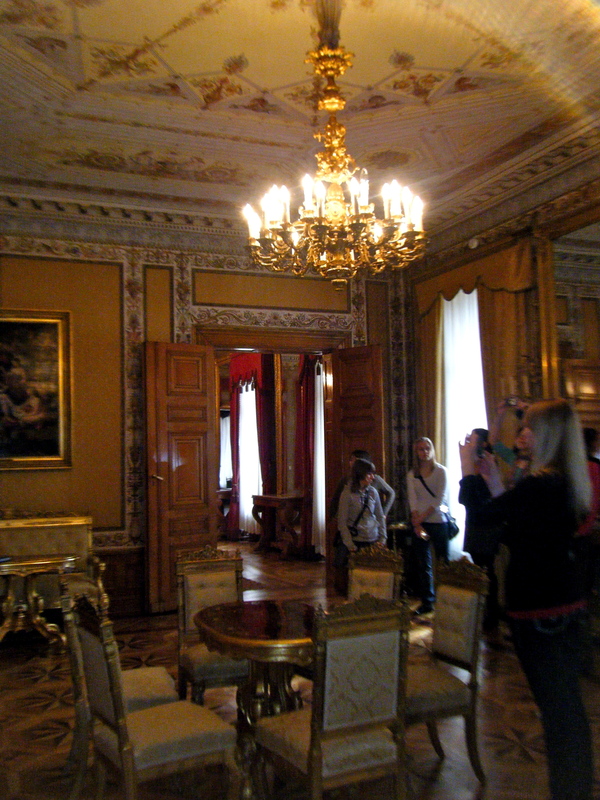 Part of the Landtag is the former home of a prominent German duke in the 1800s, so this part of the building is very beautifully and ornately decorated, with richly painted walls and ceilings and dazzling chandeliers. The newer part of the Landtag houses the actual Plenarsaal, where the representatives from the different cities debate and pass legislature. This building was a harsh contrast to the older parts, being starkly white and decidedly modern – very simple and bright, with many windows to let in as much natural light as possible. After the tour, we had about an hour and a half to wander about to find some food. A few of us stopped to get some wurst, taking in the various shops, cafes and restaurants we passed along the way. We didn’t go into many, but in general Wiesbaden seemed to be a fairly chic city, at least in the areas around the Landtag – many nice restaurants, shoe stores, purse stores, clothing stores, etc. It definitely would be a great place to shop. Still, Wiesbaden had an extremely different feel than Marburg or Frankfurt. Marburg has a lot of old-city charm, at least in Altstadt, with cobblestone streets, timber frame houses and narrow, winding ways. Wiesbaden streets were wide and stone-paved, and the buildings themselves were pretty much all from the 1800s or later. Frankfurt is some sort of fusion of the two – parts of Frankfurt are hundreds of years old, other parts strikingly modern. I’ve now only seen three different German cities, but each has been decidedly distinct. After the lunch break, we all met up again to go on a tour of the city. Again, there was the option to go on an English or a German tour, and, with my confidence boosted by the tour of the Landtag, I once more opted for the German tour. However, I soon realized that I have a maximum amount of German that I can handle in a single day, and I quickly hit my cap. It’s tiring enough schlepping all around a city, but adding the additional strain of understanding a foreign language throughout it all can really wear you out. Halfway through the city tour, I was pretty drained and understanding far less of the tour than I had earlier in the day at the Landtag. I think many of my fellow students experienced the same level of exhaustion – you don’t realize how tiring hyper-attentive listening can be until it hits you like a brick wall. So, I got something out of the city tour, but not nearly as much as I probably should have. By the end of it I was totally disengaged, just following along with the group without really making an effort to listen. –The oldest structure in Wiesbaden is the remains of a Roman aqueduct built in the 300s, called the Heidenmauer. –Wiesbaden has thermal hot springs running throughout the city, which you can touch and even drink from via various fountains and basins throughout the city. You are advised not to drink more than a liter per day. This is why Wiesbaden rose to prominence in the 1800s; it became a popular destination for people seeking to benefit from the restorative health properties of its hot springs. –There’s a really cool Russian Orthodox Church located on top of a hill. This was at the end of the tour, when I was tuckered out, so I don’t have a lot of details here. According to wikipedia, it was built in the 1850s after the death of the Duke of Nassau’s wife, who was a Russian princess. But it’s pretty, and the land it’s located on was apparently ceded to the Russian czar. So I think I also visited Russia on Wednesday? Despite being so worn out at the end of the day, I would like to come back to Wiesbaden – probably not until the summer, though. There is a lot of green space there that I think would be particularly lovely on a sunny, warm day. But since it’s located within the state of Hessen, train rides there are free for me, meaning it wouldn’t be too hard to make another trip in the future. Hopefully I can make it happen!